Ocotal Beach is a calm and perfect place to enjoy your vacations and holidays; here we give you a little guide about that you can find in this area. Ocotal beach has light gray sand, and 700 meters long, has gentle waves and clear waters. This beach is located in Papagayo Gulf, southwest of Coco Beach, in Guanacaste; about 42km from Liberia city, and about 251 km from the San Jose, the Costa Rica capital. This place is surrounded by hills and cliffs covered with typical vegetation, with dry tropical forest area. In this small beach there is not as much trade as Coco beach; there are few restaurants, lodging and nightlife, but there are good hotels, and some condominiums and houses in the hills. It's definitely more appropriate for travellers who want to get away from the hustle and bustle of Coco beach and surround themselves in nature. A great advantage of traveling to Ocotal beach, or beaches around Guanacaste, is the proximity to the Daniel Oduber International Airport, which provides quick access to the region. It is important to mention that this area was awarded the "Blue Flag" which certifies the high environmental and safety standards of Playa Ocotal. If you'd like or need more information about schedules and fares, enter the following link Rates. If you want to use public Transportation we indicate that this service is offered only to Coco Beach. There you must to take a taxi; unfortunately there is no public Transport directly to Ocotal Beach. The company that offers the service from San José to Ocotal beach is Pulmitan de Liberia, located in San Jose, 24th Street and 5-7th Avenue. Ocotal Beach is one of the cleanest and most peaceful beaches of Guanacaste, this is ideal for observing the exuberant marine life, such as tropical fish, seahorses, stingrays, puffer fish, red snapper, angelfish, eels and butterfly fish. Besides being frequently visited by dolphins and humpback whales, during the months of December and April, you'll also find a variety of sea urchins and corals. South of the beach you will find Bahía Azul or Pez Vela. 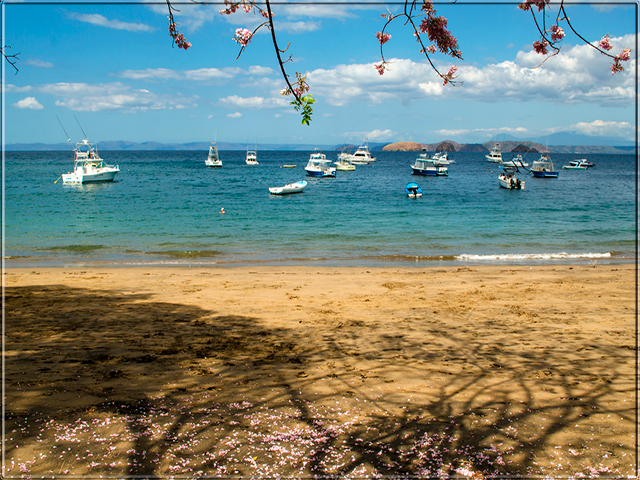 This place is a sport fishing camp, and from its hills you can enjoy a wonderful view of the Papagayo Gulf. Also south of the beach in Cirial point we recommend snorkeling and diving tours in "Las Corridas" or in Cantina Island, these points are located very close to the coast. You can rent all the equipment do you need for these tours at the entrance of the beach. If Ocotal Beach is too quiet for you, we recommend making day trips in this zone; and enjoying many beach activities and amazing food in a relaxed atmosphere.